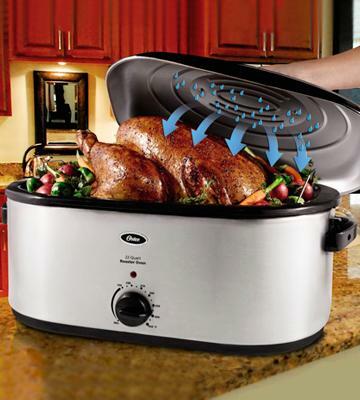 "Circle of Heat" heating element provides heating from the sides instead of from the bottom, making the cooking faster. As a result, you get a juicy and perfectly cooked meal. It is recommended to perform firing before the first use to remove any unwanted odors or smoking. This roaster oven has wonderfully convenient marking around the thermostat, that make the device an ideal choice for a novice — you will easily select the necessary mode. The roaster is great for big families and public functions. While adding height to the entire unit, the Dom Lid makes more room inside the roaster enabling you to cook a bigger amount of food as well as fit in there a whole turkey. 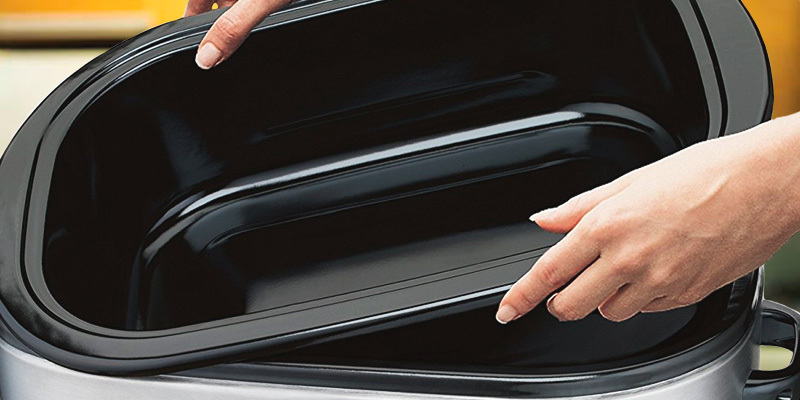 The included rack and pan are removable for easy cleanup. The rack handles might seem not sturdy enough. This roaster oven is just perfect for stewing and roasting meat, poultry, potatoes, and even cooking bakery products. Due to a quite a big capacity, it is one of the best offers for sale that a big household can find out there today. 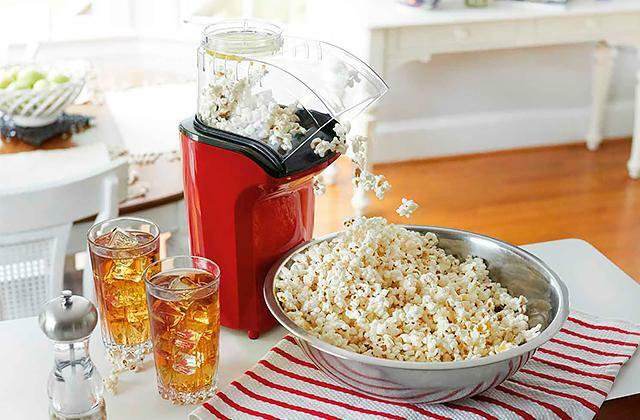 Practical, functional, and attractive, it will become a wonderful addition to your home appliances. Thanks to this large roaster oven lid's ribbed inner surface the steaming moisture runs back down on the food. This way, even the toughest meat will be cooked tender, mouth-watering and flavorful. The stainless steel looks thin, although it does not affect the quality of the meat roaster that much. The Oster pan roaster's wide range of temperatures, a good scope of supply, and big food capacity make it the best roaster for those who plan to use it not only at home but also to fix community meals. This is an affordable general-purpose home roaster. The Rival roaster oven is not one of the largest items, so it can be used for daily cooking as well as preparing holiday meals. 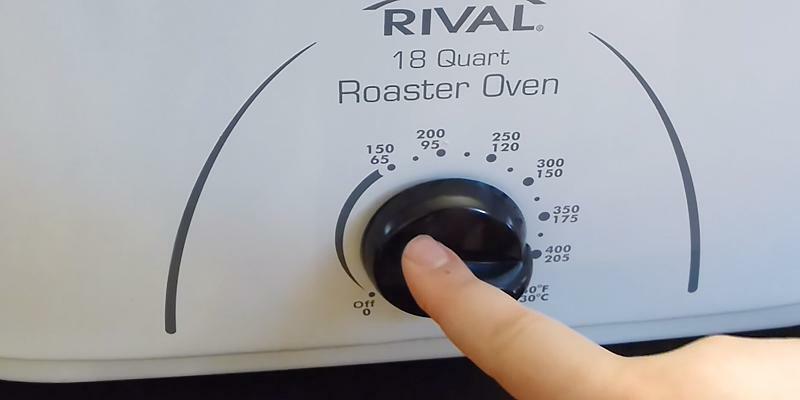 The cord of this Rival roaster oven is rather short. Still, this poultry roaster can be comfortably set on top of your table. A Rival roaster will become a perfect addition to your kitchen if you have a big family and you rarely cook dinner for less than 9-10 persons. You will prepare a 14 lbs turkey in ~4 hours. Not to mention that it will free your traditional oven to cook other meals. The pan in this chicken roaster has a wide high border to provide better access to it. This way, you will easily remove the pan for cleaning or for serving food in it. The lid might be a bit loose fit. 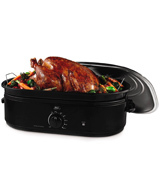 Oster pan roaster oven is a heaven-sent gift for a big family or for someone cooking for public meals and meetings. It will easily hold a turkey of 22 lbs on a Thanksgiving Day. And the black color is not easily soiled. 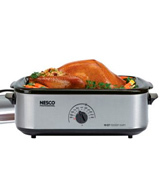 An 18-quart Nesco 4818-25PR is a perfect choice if you need to prepare a dinner for 8–10 people since it can contain a turkey of up to 22 lbs. And the unique Circle of Heat heating element (located at the sides instead of at the bottom) everything you cook will heat up evenly and the food will literally melt in your mouth. 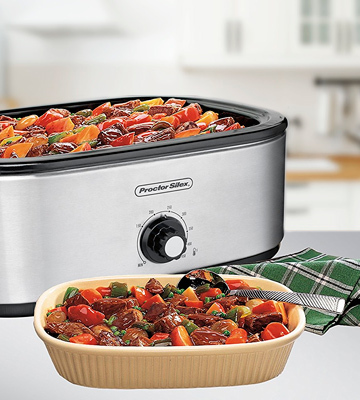 This outstanding Nesco roaster is good not only for home use but also for social events. Furthermore, its exterior is so eye-catching and stylish that you can serve the food in it! The variety of temperature modes makes this roaster a useful purchase for a wide range of dishes. 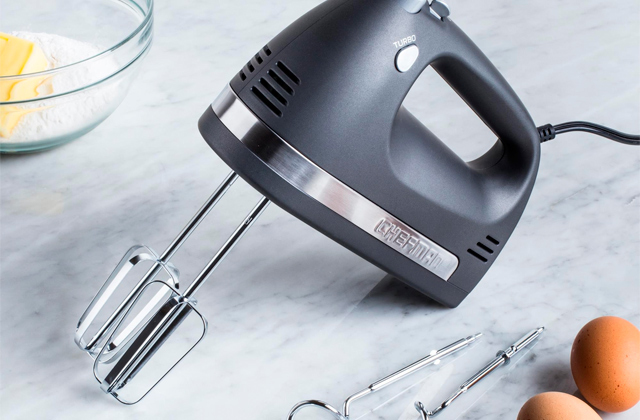 With this wonderful device, you can bake, roast, steam, and slow cook. 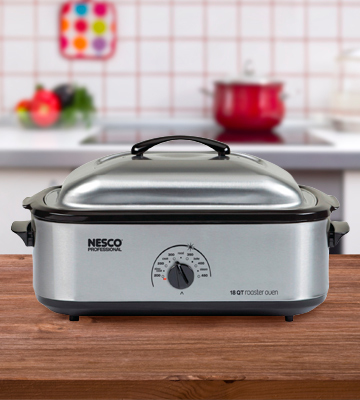 Almost every recipe can be cooked in this Nesco roaster. The special indicator will show you when the necessary temperature is reached. If you are a beginner in cooking, we are sure you will appreciate the markings around the switch that name which temperature is optimal for what. Now there is no need to flip through the recipe book to look up what temperature you need. 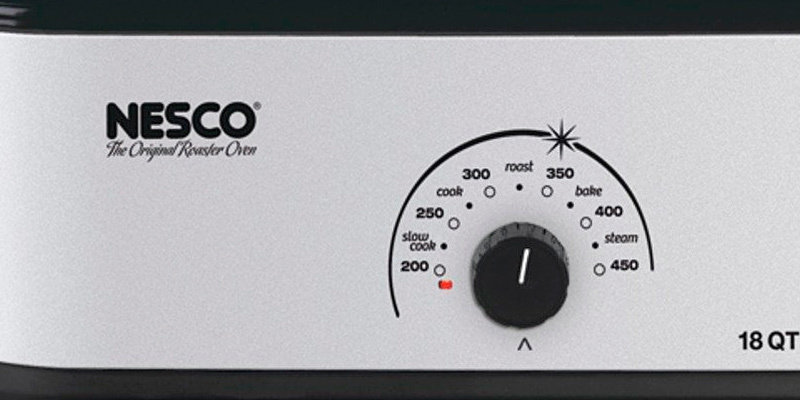 Be it a replacement or just an addition to your traditional oven, the Nesco 4818-25PR Professional Roaster Oven will become a great assistant to you, especially if you frequently cook for large companies. In order to roast an ideal chicken or turkey, be sure to use a meat thermometer, a special thermometer with a probe designed to measure the internal temperature of meat. Knowing this temperature you will know exactly when your steaks are ready and well done. Proctor Silex 32191: 9.6 in. The unit heats up rather quickly and maintains an even cooking temperature. The cookwell and the unit itself are very light weight. The best part is that the roaster pan insert is removable, is used to serve the food and cleans up really easily. There is a power saving advantage to using this appliance that reflects in my electric bill. Switching from oven to this was noticeable in our home where 95% of our meals are homemade. The Proctor Silex 32191 Roaster Oven can make your life much easier allowing you to fix a big meal for a big company of friends or family while requiring very little of your time and effort. The oven has an 18-quarter capacity which allows it to accommodate a whole lot of steaks and to house in a whole turkey with the weight of up to 24 pounds. Even if you are satisfied with the performance of your conventional oven, you may still like an idea of having the Proctor Silex 32191 as a backup oven in order to cook more dishes for your guests. The oven's performance is fast and worth admiring, really. 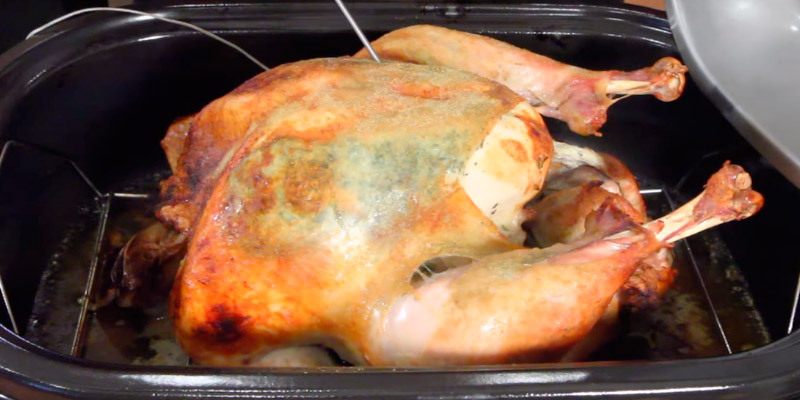 It can easily cook a 14 to 18-pound unstuffed turkey in less than 2 ½ hours which makes it twice as fast as a conventional oven! If you chop meat in smaller chunks, it will be cooked even faster. Despite the fact that this type of oven is named roaster, it is suitable not only for roasting. You can bake and stew food in it just as well. With a removable rack and pans, it also allows for steaming food, which makes it perfect for customers who stick to a healthy diet. 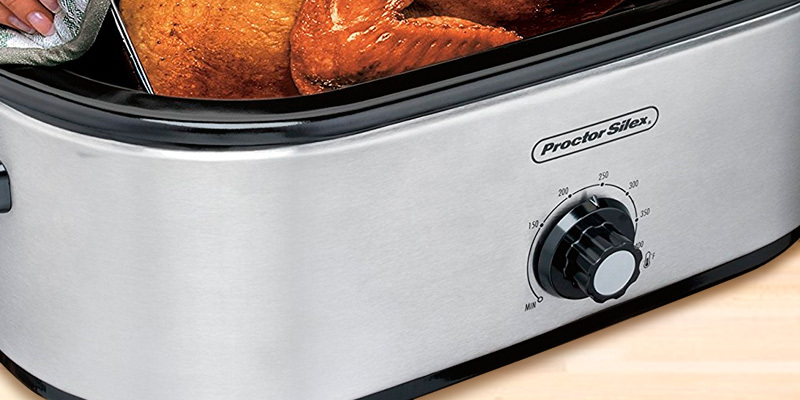 The temperature settings of the Proctor Silex 32191 that range from 150°F-450°F enable you to cook and bake dishes more thoroughly without burning or overcooking them. 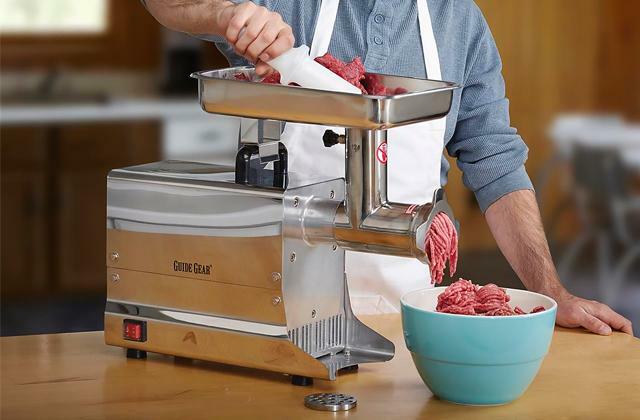 For greater convenience, the manufacturer equipped this roaster oven with a lift-out rack which not only allows for more convenient removal of meat but also allows for baking. 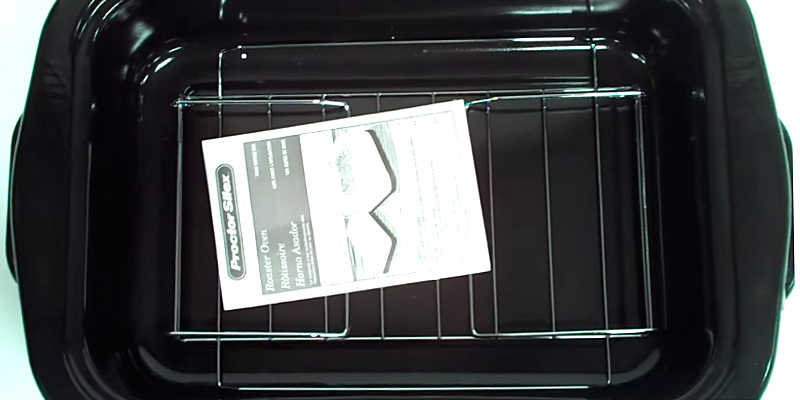 All internal parts of the Proctor Silex 32191 are removable for easy cleaning, and the pan can be used for serving food. Both the rack and the dish are easy to clean of food remnants. All you need to do is rinse them thoroughly under running water. Be wary of immersing the body of the roaster fully in water, as water may cause damage to the heating element of the device. It will be enough to wipe its housing clean with a damp cloth. Other features that add up to the usability of the Proctor Silex 32191 include stay-cool handles and rather small overall dimensions of the device, making it a portable solution for those who often need to cook away from home. Summing up this review, we haven't found a lot of differences between this roaster by Proctor Silex and many other similar products presented by other manufacturers. It has pretty much the same range of temperatures, practical features, and set of accessories. The advantage to this one, though, is that it is available for a lower price, which makes it an appealing choice for thousands of customers who are looking for a simple and practical solution and who do not want to overpay. This is truly like an oven on your counter-top with a larger capacity than most toaster ovens. I really like the design (depth and capacity) better. The rack fits into the interior pan. The pan fits into the base of the roaster. Convenient. Can be taken anywhere as long as there is an available power outlet. 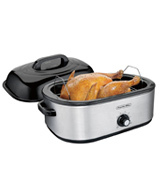 Oster CKSTRS23-SB Roaster Oven is enough for you to cook 22 quarts of food. You will be able to feed 17 adults with the main dish. Or you can use it as a second oven. 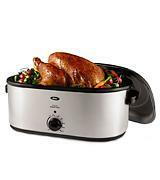 The large cooking roaster will hold a whole turkey, and your traditional oven will be free so that you could use it for cooking other meals. A stylish design with the stainless steel color housing makes this 22-quart roaster oven a great addition to the modern kitchen. It also looks pretty good to be set on the table and dish up the meal. The pan, rack, and 150°F-450°F temperature modes make it possible to prepare soup, sauce, cakes, and bread in this electric roaster oven. It is useful for cooking a whole turkey, a chicken, or big steaks. At the 150°F-200°F temperature, your dish will stay warm until all your guests arrive and you dish the food up on the table. And a self-basting lid will free you from the need to constantly monitor the meat, pour the juice over it to make it juicier. Also, it will greatly shorten the cooking time. 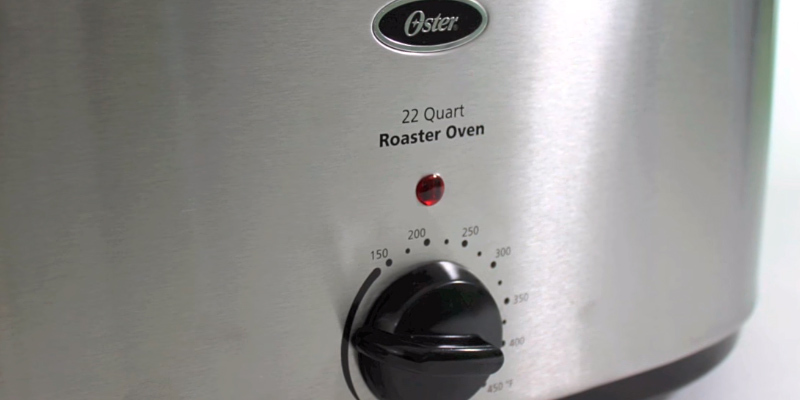 The features of this 22-quart roaster make it the most convenient. The rack has handles to easily lift the food you cooked there. The lid holders on the sides will tightly fix it so that you don't need to look for a place on your table to set the lid. The indicator will let you know when the temperature reaches the desired numbers. You won't need to bother yourself with anything unnecessary. 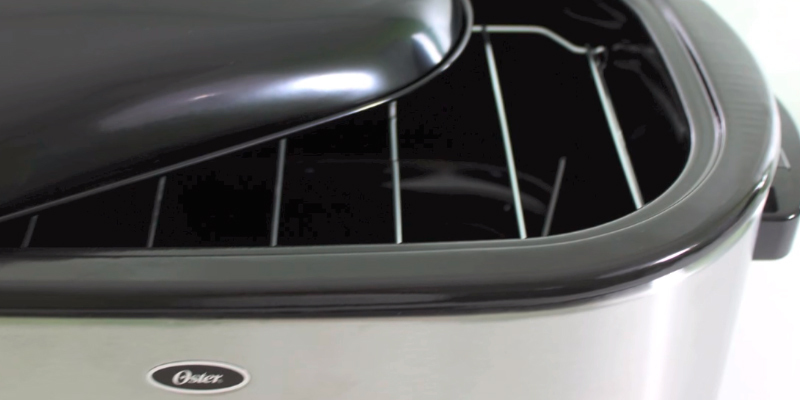 Cleaning and maintaining this pan roaster is extremely simple. Just wipe the body and the lid with a damp cloth after each use. And the inner parts like pan and rack are easily washed with hot water and cleanser. Proctor Silex 32191: 18 qt. Other than that I like how it cooks my food because of the temperature control knob and that is a big bonus. The size of this roaster is huge. I had an average size turkey, I probably had enough room to fit another turkey in there. The built-in lid holder is convenient. The heat (power) output of this model is not enough to boil soup when it is filled with 12 quarts of soup. This Rival roaster oven is a device of more or less average capacity, 18 quarts, but it is still more than enough to prepare food for 9-10 people. You will be able to fit a turkey of approximately 18 lbs in this home roaster. It is white in color, and white is a color that matches every interior. The roaster is performed in a beautiful oval shape, and overall it looks so good that you will not think twice before setting it on the table for all your guests to see. 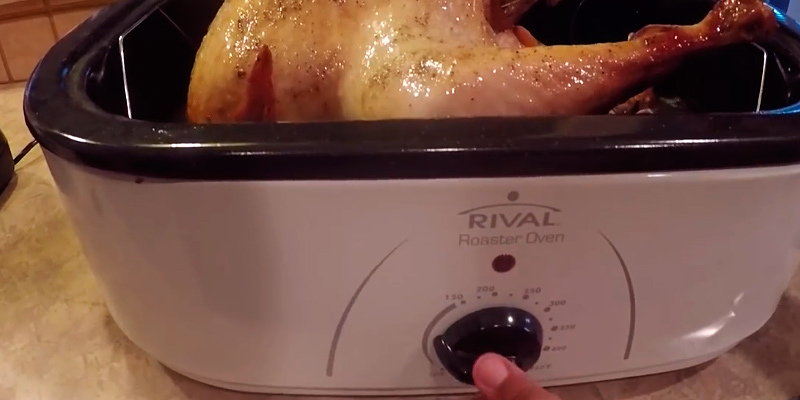 Rival RO180 Roaster Oven is a multi-purpose chicken roaster with temperature modes of 150°F-450°F. 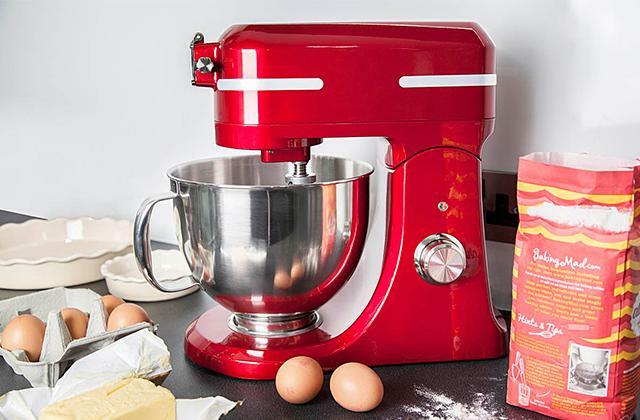 This range of temperatures is perfect to cook different kinds of meat, puddings, sauces, cookies and buns. 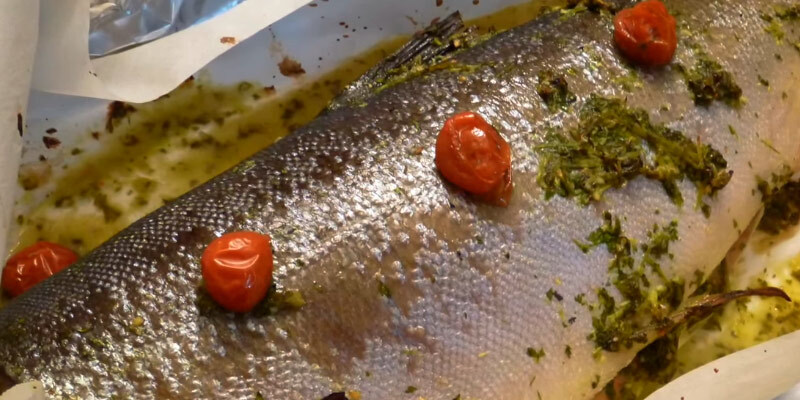 You can roast, bake, stew, and bring to life a variety of cooking methods. 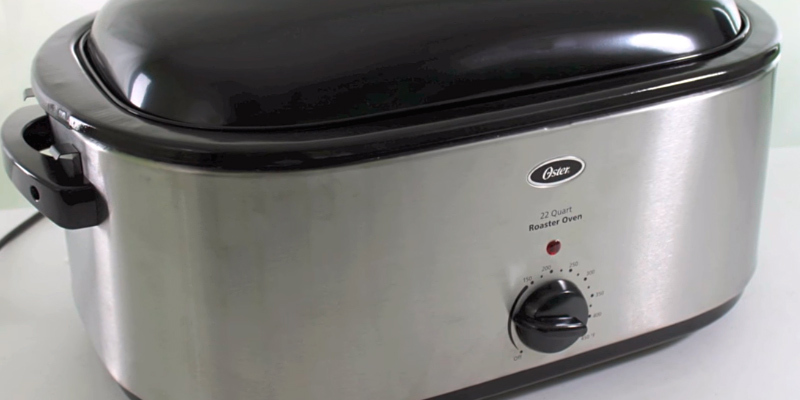 This roaster can also act as a slow cooker when used at 200°F-250°F. The great number of cooking options is due to the pan and the rack that go with the purchase. The range of useful features, accompanied by the easy cleaning procedure makes this pan roaster an extremely handy purchase. To clean the slow roaster after using it you only need to put the lid, removable pan and rack into the sink with hot water and let them soak. After a few minutes, you will clean them with no effort at all. 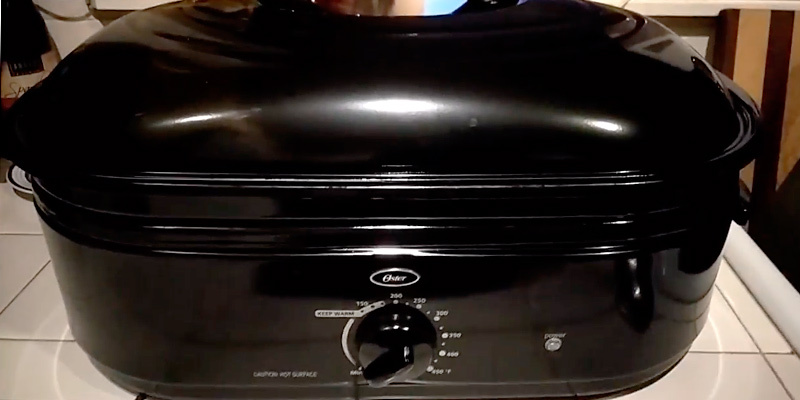 And you can clean the body of the electric roaster oven by wiping it with a damp cloth. The non-heating handles will allow for easy moving of the device even if you just turned it off. But be careful! Even if the handles are cool, the walls of the roaster are still quite hot. After setting the pan roaster on your table, you can fix the lid with special holders. And if you cooked meat of poultry and decided to serve it in a different tableware, you will easily lift the rack with hands. Proctor Silex 32191: 17.25 in. The unit works fine otherwise and has a extra large capacity. Nice size for potlucks and large dinners. 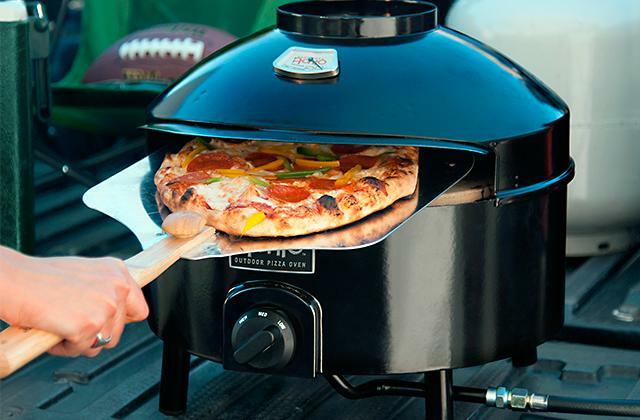 Great product for the price and not only can you cook but it functions as an oven as well! The unit is easy to clean, easy to use and runs on 1450 watts (15 amp breaker will handle this) instead of your oven power. What other whistles and bells can be added to a device like a roaster? At first glance, everything is already thought through. But there is always some room for improvement, Oster thinks. And they created Oster CKSTRS18-BSB Roaster Oven with a Self-Basting Lid to prove this. 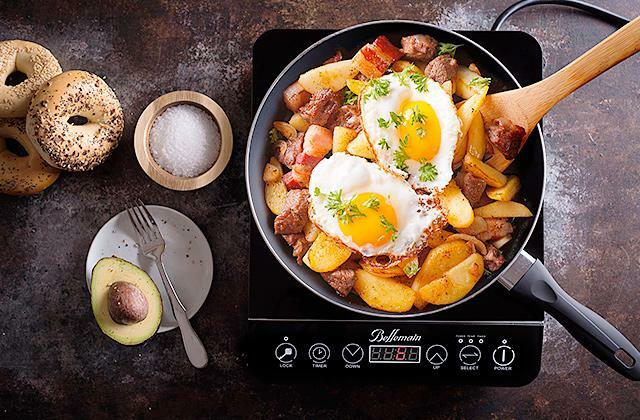 This roaster has everything a cutting-edge device needs and it will be a great buy for a big family or a cook that often participates in social events and dinners. Same as many other roasters, it is a great alternative to an oven. So, what's the difference? If you look closer you'll see that it has a wide border that is higher than the border of the device. Well, this might seem a minor benefit at first, but the shape of the pan here is actually the real thing! This is made to help you lift the pan easily. It helps with both serving and cleaning. We think every housemaker will appreciate a roaster with such feature. As we've already stated before, a roaster can sometimes replace an oven. This means that it is not limited to cooking turkey or chicken, there are modes for just about any dish. But there are several lifehacks. When roasting, use a rack. This way, the oil will flow down but the meat will still be soft and mouth-watering. The rack can be used for baking too. Just cover the bottom with foil paper, preheat the roaster, and put your soon-to-be cookies in there. Then wait the needed time and voila, it's ready! The same goes for making bread or baked casserole — cover the rack, preheat, put the dough, set the time according to the recipe. With a roaster at hand, a problem of warm appetizers is solved. Put the food inside for the time being, set the temperature at the lowest, and leave it there until you need it. 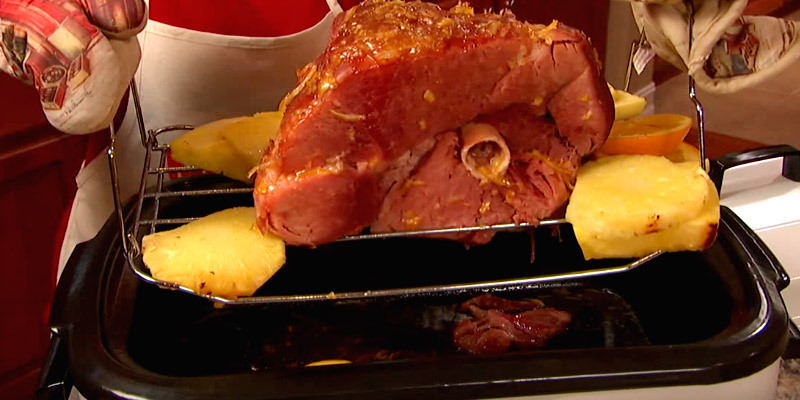 It will stay warm and juicy, and you won't need to go cook in the middle of celebration. Go enjoy friendly talks and don't worry about food. One of the kitchen appliances we'd definitely recommend you to purchase, especially if you've got kids, is a juicer. Considering all the benefits of juicing and the number of vitamins it can supply your body from a single serving, all your family will benefit from starting their day with a glass of freshly extracted juice. Proctor Silex 32191: 13.7 lbs. This item is great, I did not have to calibrate the temperature, it was fine. It's fairly light weight and cleans up easily. The roasting pan cleaned up easily. We have made meatballs, roasts and other meats. This little roaster is a power house! I have used it a few times and it works beautifully. A roaster looks like a big slow cooker. Owing to the option of setting low temperatures, it can also work in a similar way, that is, cook food for a long time. But at the same time, the temperature modes of a roaster oven are more varied, so this device is perfect for baking and roasting. To be exact, you will be able to cook in a slow roaster oven every single recipe you cooked in your traditional oven before. But when compared to a traditional oven, the beef roaster still has a few benefits. It is easier to clean. Owing to the design, the pan roaster is much more cost-efficient, needs less power to heat up and maintain the temperature. 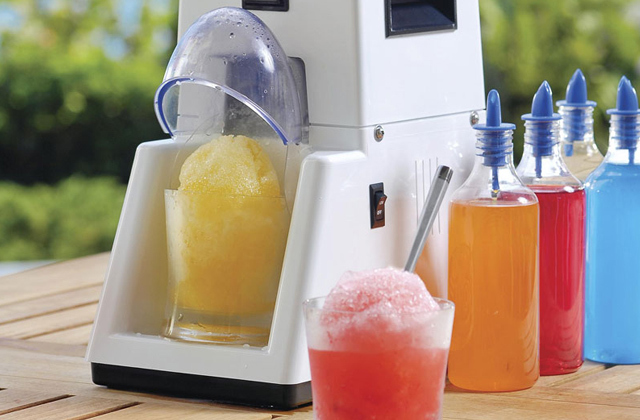 It is also more portable, so you can use it wherever there is an access to the power line, like on your backyard patio. The distinctive feature of turkey roasters is their size. You will be able to cook a whole turkey or a 20 lbs chicken, and feed a big party, a company of family and friends. No problem with preparing a festive table for the Christmas, the Thanksgiving day, or another event, with all the relatives gathered around. 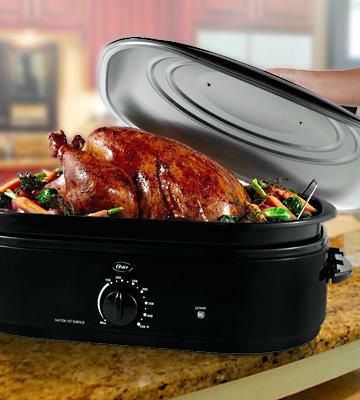 If you read our best roaster review till the end, we are sure you will find the very turkey roaster oven that is good for you. 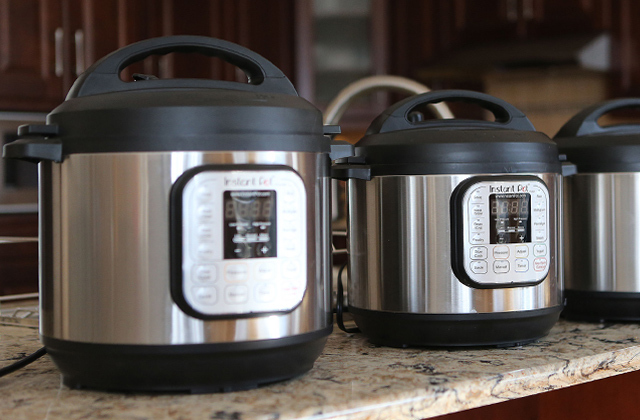 The slow cooker is a device similar to the roaster. 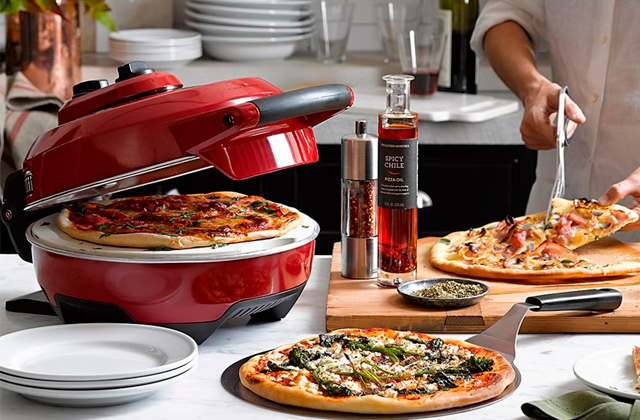 With it, you will be able to cook any dish that requires a lot of time. 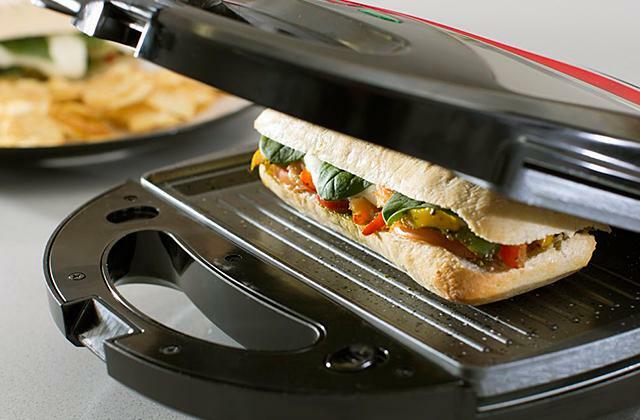 It will be a useful addition to your kitchen's everyday appliances thanks to a smaller size. 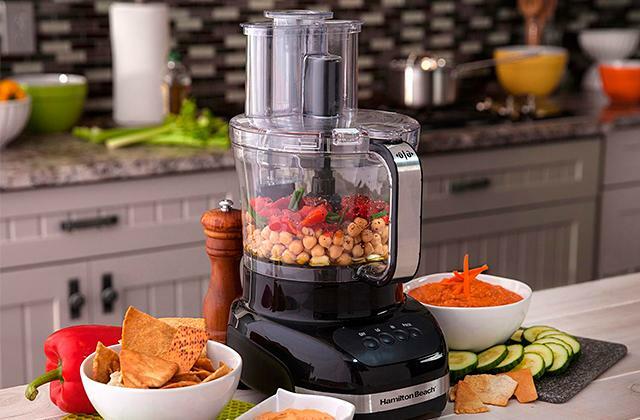 To quickly cut vegetables or mince meat for various recipes, you may find it useful to have a food processor, and to nicely slice the already cooked meat, electric food slicers will be good. 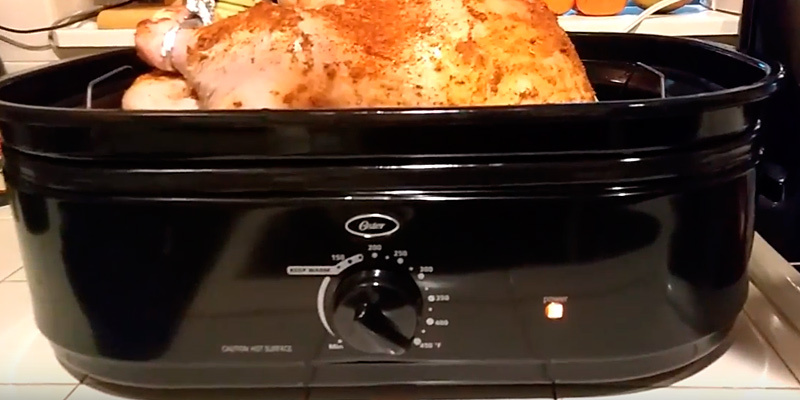 The first thing to consider when you purchase a turkey roaster oven is its capacity. You will probably encounter slow roasters with a 6 to 22 quarts capacity the most often. The 6-quart capacity is enough to feed a small family of 3 to 5 people. But the most popular are the 18-quart to 22-quart pan roasters. 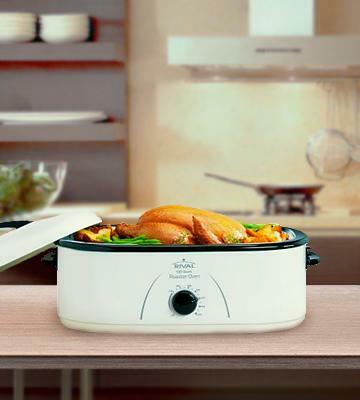 Using this kind of poultry roaster, you will be able to prepare meat, poultry, vegetable sauces, puddings, or soup to feed not only your family but all the guests who you invited for dinner. The best roaster reviews say that this volume of food is good for 10 to 17 adult servings. Also, these kinds of beef roasters are often used to prepare food for community meals and parties. We have already mentioned it before, but the home roasters' cooking features to prepare recipes in various ways are truly extensive. However, depending on the temperature modes your electric roaster oven can manage and its scope of supply, the features can decrease, so pay attention to this too. First and foremost, the chicken roaster is a device, created to roast and bake food, the same as your common oven. In this case, the meal will be prepared in a pan. The pan is included in every cooking roaster. The average temperature mode to bake meat and poultry ranges between 325°F-450°F. 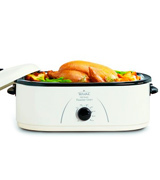 Some turkey roaster models may act as slow cookers, that is, braise food for a long time at approximately 200°F-250°F. This way even the toughest meat will become tender and literally melt in your mouth. Few electric roaster ovens are good for baking puddings, baked rolls, or even bread. The average temperature, in this case, will be 325°F-425°F. Also, it will be great if your meat roaster has a rack to place the baking sheets on when you use the roaster for this. The rack will come in handy when you decide to steam food without an ounce of fat. Just pour some water into the pan, put your meat or veggies on the rack, set the rack on top of the pan. At ~400°F temperature you will after some time get a healthy and tasty meal. The 150°F-200°F temperature will provide for keeping food warm before you dish it up. It is a useful feature if you haven't finished cooking other meals in time. And you can use this setting to warm up the already cooked food. And one more parameter to think about before making a final decision is the convenience of electric roaster oven's use and maintenance. As these devices tend to heat up really bad during cooking, you may want to have non-heating handles. At the same time, remember that a high temperature is just an operational aspect for this type of devices, so be sure to always have an oven cloth within reach. Then there is an option of having an indicator to notify you when the desired temperature is reached. Specific holders for the lid on the body will be of use when you dish up the meal, as you won't have to look for a place to set the lid. If you are going to cook big chunks of meat or poultry on the rack, having handles there will help you easily lift food from the electric turkey roaster. A removable lid, pan, and rack, when they are easy to wash, drastically simplify the roaster's maintenance. Sometimes you can even wash particular parts in a dishwasher. And to clean the roaster's body it is often enough to just wipe it with a wet cloth. Every housewife knows that when you cook big slices of meat, the juice released from it must be constantly poured over the meat again. This is made in order to prevent overdrying. But the home roaster will spare you this problem. 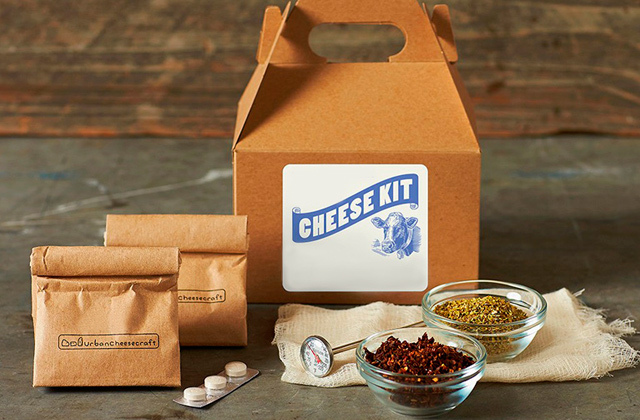 The tight-fitting lid will not allow the moisture evaporate and will preserve all the food flavors inside. The meat is cooked faster, and yet it is more juicy and tender. 1. Donna Currie The 8 Best Rotisserie and Roaster Ovens to Buy in 2017, The Spruce. October 10, 2017. 2. Jonae Fredericks How to Bake in a Roaster Oven, eHow. 3. CHRISTINA SCHNELL Difference Between Cooking in a Regular Oven & in a Roaster Oven, LIVESTRONG.COM. February 18, 2015. 4. Julie Miller The 7 Best Roasting Pans to Buy in 2017, The Spruce. October 10, 20176. 5. Cheryl Cirelli How to Use a Roaster Oven, LoveToKnow. 7. Fred Decker Does a Roaster Oven Cook Faster Than Your House Oven? Our Everyday Life. 8. Fred Decker Difference Between Cooking in a Regular Oven & in a Roaster Oven, Our Everyday Life.